Whether you want a truck for work or to be able to tow your ATVs or motorcycles to the desert on the weekends, there's a Toyota Tacoma that's perfect for your cargo needs. Designed to withstand the rigors of heavy use on rough surfaces, there's no situation the truck can't handle with ease. The 3.5L V6 engine give the Tacoma a towing capacity of 6,800 pounds. It can carry a 1,400-pound payload with ease, and you'll still have the power to keep your speed up when going up hills. The hot-stamped alloy frame is designed for performance and durability, and you won't have to worry about putting it under too much strain. 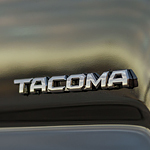 Brunswick Auto Mart keeps many different Tacoma models in stock so that we have something for everyone. Visit our showroom in Brunswick today to see what we currently have available.